This is a list of cities and towns in Ethiopia, ordered for their size and also ordered for their letters. The table below shows cities and towns with more than 40,000 inhabitants (from the projection for 2016 by using the 2007 census data). The population numbers are referring to the inhabitants of the cities themselves, suburbs and the metropolitan area outside the city area are not taken into account. Given the suburbs and the metropolitan area, the number of inhabitants might be much larger in several cases. 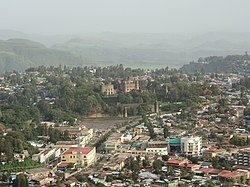 Addis Ababa, for example, might have a total population of 4.5 to 5 millions if also taking the metropolitan area into account. Some towns which should be beyond a number of 40,000 inhabitants (like Holeta) are not shown as the last census happened in 2007. At that time, the area of some towns was different which makes it hard to provide numbers. Also, the last census happened in 2007, which results in major uncertainties. The next major census to account for these issues is foreseen to happen in February 2018. The listings do not have a threshold for the size of the towns and cities. Addis Ababa, the capital of Ethiopia. ^ Central Statistics Agency (Ethiopia). "Population and Household Census Ethiopia 2007, Region Amhara" (PDF). www.csa.gov.et. Retrieved 2016-08-25. ^ Central Statistics Agency (Ethiopia). "Population Projection of Ethiopia from all Regions at Wereda Level for 2014–2017" (in English and Amharic). www.csa.gov.et. Retrieved 2016-08-25.